News commentary, WTVD-TV ABC 11 Eyewitness News. Raleigh-Durham, North Carolina. September 25, 2013. News commentary, WRAL-TV ABC 11 Eyewitness News. Raleigh-Durham, North Carolina. February 5, 2013. Raleigh-Durham, North Carolina. March 9, 2012. 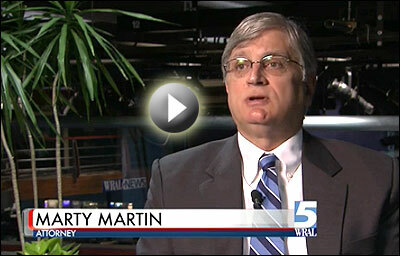 Based on his experience with many facets of nonprofit management and board governance, Marty Martin is often contacted by media representatives to interpret and comment on news stories in these areas. As the video clip at right and the citations below testify, Marty is a valuable asset when complex stories need to be told to lay audiences in clear and accurate terms. If you would like to speak with Marty about topical issues in any of his practice areas, please contact him via the Contact page. Here is a copy of Marty's bio sketch for press and speaker introductions . See video clips for TV interviews on the right. Chatham Park developer moves to knock nonprofit from lawsuit. News and Observer. November 26, 2014. North Carolina Republican Party takes aim at liberal NC Progress group. WTVD – TV ABC 11 Eyewitness News. Raleigh-Durham, North Carolina. September 25, 2013. IRS receives ACT Report today; recommendations affect exempt organizations. Philanthropy Journal. September 12, 2013. Could online form help prevent future IRS targeting? USA Today. September 12, 2013. IRS Tests Interactive Charity Application Form. The Chronicle of Philanthropy. September 12, 2013. IRS makes progress in creating Interactive Form 1023. Jill Warren Lucas, Philanthropy Journal, May 6, 2013. Country Clubs and Homeless Shelters: A Nonprofit is a Nonprofit?. Jeanne Allen, Nonprofit Quarterly, February 11, 2013. Online resources help donors safely support global charities. Jill Warren Lucas, Philanthropy Journal, December 10, 2012. Making Mergers Work. Dr. Brenda Summers, Philanthropy Journal, June 21, 2012. Advisory Committee Provides Recommendations to the IRS. Staff report, Philanthropy Journal, June 20, 2012. Pope Foundation failed to file tax returns on time. Independent Weekly, March 11, 2011. Lincoln Community Health Center faces loss of federal funding. Martha Chen, Triangle Business Journal, February 25, 2111. IRS Workshop to help NC nonprofits. Triangle Business Journal, September 29, 2010. Tax Workshop for nonprofits offered. Triangle Business Journal, September 22, 2010. Nonprofit boards ‘in denial’. Todd Cohen. Philanthropy North Carolina. December 3, 2007. “Board Culture: How to Prevent a Shift in the Wrong Direction.” Webinar. BoardSource. Washington, D.C. January 2013. “Starting a Nonprofit—What You Need To Know.” Web based “Live Discussions” series. The Chronicle of Philanthropy. May 2009. “Board and management transparency: Making Sense of the new Form 990.” National webinar. Philanthropy Journal. Raleigh, North Carolina. February 2009. “Duty of Care--An Evolving Standard.” Webinar. South Carolina Association of Nonprofit Organizations. Columbia, South Carolina. October 2007. “Records. Read. Retain. Retire.” Web seminar—members only. Small Association Community. ASAE and The Center for Association Leadership. Washington, D.C. November 2006. “Asking for Direct Links to the IRS Charities & Non-Profits’ Homepage.” Letter to the Editor. EO Tax Journal 2016-42. March 1, 2016. “Lawyers Serving on Nonprofit Boards.” Letter to the Editor. EO Tax Journal 2014-180. September 11, 2014. “Lois Lerner in North Carolina.” Letter to the Editor. EO Tax Journal 2014-126. June 25, 2014.